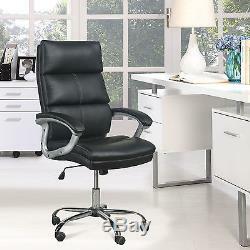 Luxury Swivel Executive Office Chair High Back PU Leather PC Computer Furniture. 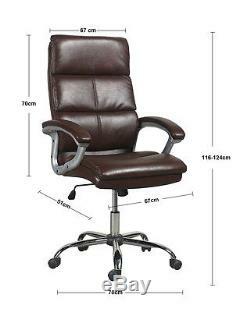 Brand New, Top Quality Luxury Swivel Executive Office Chair High Back PU Leather. High quality luxurious PU leather with stitching. PU Leather upholstery with thick padded seat. Good Durability With Breath Ability. Offer extra comfortable in many hours. Bring luxury comfort with soft pad, contoured Arm Rests. And the pads are filled with fire resistant foam. Multilayer Soft Pillow Design for real comfort. High Back support with Original Clipper-Built Ergonomic Design. Strong 5 castor-wheel Chrome base, foot gripped design For Greater Stability. Lumbar support, 360 degree swivel. Oil and water resistance, Easily Cleaned And Fade Resistant. Vigorous quality checks are made throughout the entire manufacturing process. All Certificates have been Attached for your full Peace of Mind to Prove Quality & Safety. Diameter of the Base:700mm. Seat Width:67cm Seat Depth:51cm. Backrest Width:67cm Backrest Height:70cm. SKU: LHSA00002(Black) LHSA00003(Brown). Limited Quantity , First Come First Serve. What Are You Hesitating For? Be Lucky to come and GET the FREE GIFT NOW!!!!!!!!!!!!!!!!!!! 2KW Portable Floor 2 Fans Thermostat Electric Heater 2 Setting Hot Cold Blow. 400W/800W Electric Portable Heaters 2 Bar Quartz Heater For Home & Office. 1200W Electric Oscillating Halogen Quartz Heater 3 Bar Portable For Home & Office. PU Leather Luxury Swivel Executive High Back Office Chair PC Computer Furniture. Please make sure all detail are correct and you must inform us if there's any changes within 2 hours. This offer extends to the UK mainland only. Should a significant delay occur we will contact you with the option of cancelling your order. Please check package condition when signing in. If the item or packaging has been badly damaged or opened you must make a note of this with the courier when signing. Do not reject the goods, you must sign for them and then notify us of any problems. A undeliverable address supplied by customer. B customer rejects their order when our courier tries to deliver it. Return of faulty goods within 45 days. Once return been confirmed we'll provide a pre-paid return label. In this case the pre-paid label MUST be used. If you send your item(s) back using an alternative method we will not be responsible for the costs incurred in doing so. Please read these terms and conditions carefully before placing any order. We reserve the right to change these terms and conditions in future without prior notice so please check regularly for updates. All items are IN STOCK at time of listing. The item "Luxury Swivel Executive Office Chair High Back PU Leather PC Computer Furniture" is in sale since Wednesday, March 04, 2015. This item is in the category "Home, Furniture & DIY\Furniture\Chairs". The seller is "gizzauk1" and is located in Antwerp. This item can be shipped to United Kingdom.